Creating aesthetically pleasing products was the goal of some device cover and speaker companies this year at the Consumer Electronics Show in Las Vegas. While durable and weather-proof device covers saturated the exhibit floors, one Turkish cover company didn’t go the rubber route. Genuine leathers and woods are the materials of choice for Trexta, which operates its U.S. hub out of San Diego. “We keep getting bigger every year. We’ve got a lot more product,” said Cris Monge, customer relations and sales associate of the 23-year-old company, at the company's CES exhibit. Its line of snap-on covers and mobile phone cases fit the iPad, iPad mini and Nokia Lumia, among others. One of its functional leather phone cases doubles as a wallet, containing a slot for credit cards. “You can use it as a desk stand, and it rotates,” he added. Trexta's sports series of basketball and baseball covers is gaining a large fan base, Monge added, and users can feel like they are holding real NBA and MLB equipment. He explained the science behind the basketball cover's tiny orange bumps. “We use the same leather they use to make the basketballs. We work with the same manufacturer,” he said. Its technology molds leathers and woods onto a hard plastic shell. 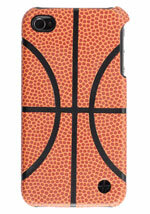 Trexta's snap on sports series for iPhone 4. Courtesy of Trexta. The company's San Diego location, dubbed Trexta Americas, acts as an office and warehouse. “It pretty much takes care of North and South America,” Monge said. Trexta's factories in Turkey make the bulk of its product. Nationally, Wal-Mart is its biggest retailer, and the company is working with others like Best Buy and Amazon. Chinese speaker maker Edifier, another CES exhibitor, may have a higher price point and higher-end retail plan than Trexta, but it has the same stylish goal in mind. The company is slowly making a name for itself in the United States and is in talks with Nordstrom to start carrying its line. Its $349.99 horn-shaped stereo speakers called Spinnaker are among its best sellers. With bright lights, artsy offerings and plush white carpet, its CES exhibit looked more like an actual museum exhibit. One of its multimedia speakers is an ode to painter Piet Mondrian and features one of his signature abstract designs. One of Edifier's prototypes on display was a sleek, white explorer’s torch light that doubles as a speaker and supports FM radio and microSD file playback. The company is also prepping to release Bluetooth-enabled portable speakers that have a rechargeable battery. Buyers can find the Easter egg-colored speakers on the market this spring. The company is waiting to see how the market receives the rectangular speakers, since some consider pastel colors to be outdated, according to an Edifier rep. While many companies at CES displayed attractive products, some are going further and making tech products for the fashion industry. LG, for example, wants to change the way people shop. At CES it showed off a new virtual store that showcases different Puma shoes on a touch screen, and users get detailed descriptions and more photos when they tap a shoe. The concept could be used for advertising at subway stops, according to an LG rep. In addition, its virtual fitting store revolutionizes the changing room by letting users stare at themselves in a mirror and "try on" different items with a swipe of a screen. They can even capture a photo of an outfit imposed on their body to mull over the buy.